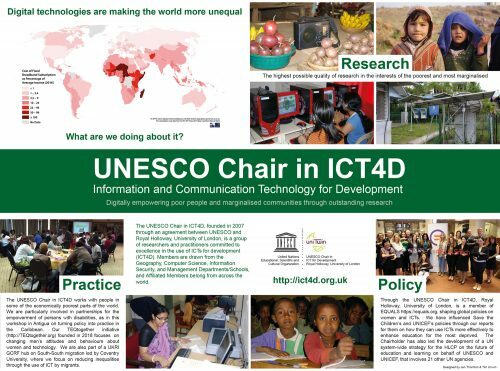 The UNESCO Chair in ICT4D is committed to making its expertise and knowledge as far as possible freely available to those who can benefit from it. To this end, this section of our site provides access to course outlines and reading lists from our members on various aspects of ICT4D that we hope people will find useful. In part, this is a response to requests from people who are already busily employed, but are thinking of trying do to a part-time specialist Masters degree. It is extremely difficult to juggle such demands successfully, and we hope that by making course materials available in this way such people can benefit from structured reading on important themes in the field of ICT4D. The link for each course, or theme, listed below leads to a list of its various elements, and the material relating to them. These resources are made freely and openly available. We request, though, that any use made of them is cited according to the following style: UNESCO Chair in ICT4D/Author: [Author’s name]/Date.